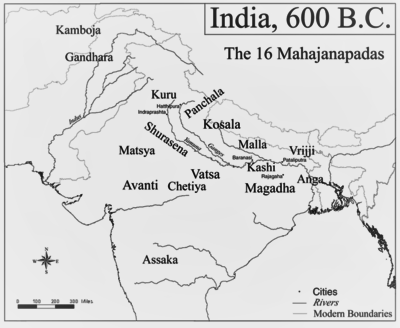 Among and alongside the Mahajanpadas, there existed many republics in India in the 6th century BC in Eastern Utter Pradesh and Bihar and in the Indus basin. In the republics, real power lay in the hand of tribal oligarchies. The central feature of the republican government was its seemingly corporate culture. The representatives of the tribes and the head of families sat in the public assembly. The Assembly was presided over by one of the representatives called the Raja or Senapati. The elder members of the elite classes formed the core of these assemblies. However, the absence of Monarchy did not really mean the prevalence of democracy in the true sense of the term. Members of the ruling tribal assembly belonged mostly to the Kshatriyas caste. In many of the republics, mostly the non- Kshatriyas, slaves and wage labourers, had no place in the assemblies. Administration consisted of the Raja (king), Uparaja (vice-king), Senapati (Commander), Bhandagarika (Treasurer), Mahamattas (Mahamatya) and Amachchha (Amatyas). The period from 6th to 4th century BC saw the struggle for Supremacy amongst the four Mahajanpadas- Magadha, Kosala, Vatsa and Avanti. Ultimately, it was Magadha which emerged as the most powerful and prosperous kingdom in North India. Though the founders of Magadha were Jarasandha and Brihadratha, its actual growth started under the Haryankas. • Advantageous geographical location with both Rajagriha and Pataliputra situated at strategic locations. As a result of its location, Magadha could also effectively command the Uttrapatha or the Northern route, lying to the North of the river Ganga. The river also facilitated transportation by acting as artery connecting Magadha with different regions. • Abundance of natural resources, such as iron, enabled the Magadha rulers to equip themselves with effective weapons, thereby facilitating the expansion of the agrarian economy and thus generating enough surplus so extracted by the state in the form of taxes. • The alluvial soil of the Gangetic valley and sufficient rainfall were very conducive for agriculture. • Rise of towns and use of metallic money boosted trade and commerce. The princes could levy tolls and accumulate wealth to pay and maintain their armies. • Use of elephants on a large-scale in the wars. • Unorthodox character of the Magadhan society. • The contribution made by several enterprising and ambitious rulers and their policies. The Sakyas of Kapilavastu: This republic was situated on the northern boundary of the Nepal Tarai region. Its capital was Kapilavastu . Lord Buddha was born in this republic. Bulli of Alkappa: The Bulli republic was situated in the modern day Shahabad and Muzaffarpur district of Bihar. Kalam of Keshaputta: Alara Kalam, the famous preacher of the Lord Buddha, belonged to this republic. Bhagga of Sumsumgiri: The republic was spread in the modern day Mirazapur district of Utter Pradesh. Koliya of Ramagram: It situated in the modern day Rampur- Deoria regions of Utter Pradesh. The Koliyas belonged to the Ikshwaku Clan. Malla: The republic of Malla included the regions of modern day Gorakhpur district in utter Pradesh and Champaran and Saran districts of Bihar. Initially, Chandrakanta was the capital of the republic. Later, Kushinagara (famous for the Mahaparinirvana of the Buddha) and Pava (associated with the death of Lord Mahavira) were made the two capitals of Malla. Moriya of Pipplivan: Pipplivan has been identified as Up Dhauli in Uttar Pradesh. The Moriyas of Pipplivan are considered the ascendants of the Mauryas. Videha of Mithila: In the Buddhist era, it was a part of Vajji Mahajanpada, but gradually turned into a republic. Lichavi of Vajji: It was a confederation of republics, which also included the Licchavi republic, the capital of the Licchavi republic. The capital of the Licchavi was Vaishali, which had been founded by king Vishal.